Original Australian Daybill movie poster. 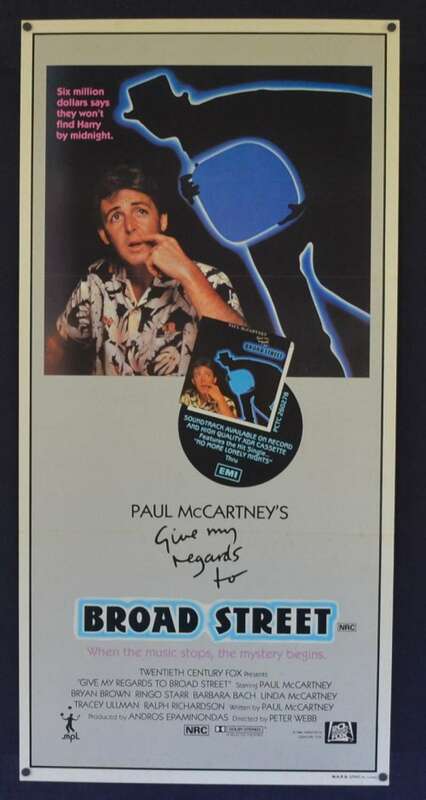 Give My Regards to Broad Street is a 1984 British musical drama film directed by Peter Webb and starring Paul McCartney, Ringo Starr and Bryan Brown.George Harrison was invited to participate but chose not to. The film covers a fictional day in the life of Paul McCartney, and McCartney, Starr and Linda McCartney all appear as themselves. Despite Give My Regards to Broad Street being unsuccessful in the box office financially and critically, its soundtrack album sold well. Filming and recording of Broad Street began in November 1982, after the completion of Pipes of Peace. Production on the album and film continued until July the following year. In the interim, Pipes of Peace and its singles were released, and the film project was thus scheduled for an autumn 1984 release once an appropriate amount of time had passed. The film was the result of a long-held ambition of McCartney, a lifelong film fan, to become involved in acting again after his success with the Beatles' films. Edge Wear / Stains: Foxing marks appear around the bottom issued centre fold, at the bottom beneath the bottom credits area and at the top grey area above the artwork.